“Caribbean Cache” by Lee Storm is the second adventure in the Mack and Carly Adventure Series. This one begins with the couple once again in danger from the people that were chasing them in the first adventure. They thought this problem was behind them and could enjoy sailing to exotic places, while enjoying life with each other and their dog. Instead, the drama begins when they are discovered by the original owner of the catamaran, before it was seized and sold to them. In their last adventure, Mack and Carly discovered a hidden cache of treasure worth $15 million, and were brutally attacked by the drug smugglers trying to regain this property. Defending themselves, they were able to hide much of it in safe locations. When this evil character makes an appearance, they only have one way to deal with the situation, and it results in his death. While they try to make it look accidental, they find there are too many people who have stakes in this game, so they have to go on the run from the drug smugglers and pirates hired to capture them. Things become very difficult once they are captured, so Mack and Carly must rely on their wits to get out of this current situation. It is not easy, but it sure makes for quite an adventure. From the Mediterranean through to Africa, the couple is desperate to survive and make it back to their home on the island of Dominica. Meanwhile, they also experience a huge surprise, which is guaranteed to change their lives forever. I really enjoyed reading this adventure. I think most readers can picture themselves leading an idyllic life aboard a $400,000 catamaran. But, when I read about the drug smugglers, pirates, and some of the unsavory places that once seemed exotic, I find myself happy to be an armchair traveler, enjoying the ride through the power of written words. The author does an excellent job of using his own personal experience of living on the sea to bring this story to life. 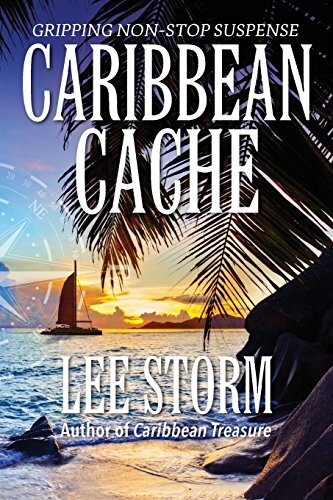 “Caribbean Cache” by Lee Storm is highly recommended reading for someone who needs a good escape! I look forward to reading the third book in this trilogy.